A compass rose is a circle showing the principal directions (N, S, E, W) printed on a map. Imagine an illustration of a sailboat afloat in a porcelain cup placed upon the center of a compass rose. This is the symbol on the bags of tea by tea.o.graphy, a loose-leaf tea company here in Taos. The logo is intricate and requires study, but it’s worth a look. It says a lot about tea.o.graphy’s tea and the woman behind it. Dana Blair grew up in Georgia. She has blonde hair and a bright, open face. She exudes shyness, but a glimpse of her smile reveals warmth. Dana started tea.o.graphy in the spring of last year but has been studying, crafting, and experimenting with tea for many years before that. I drink tea from tea bags that come in a box of twenty, and used the word tea tree instead of tea plant to describe where tea leaves come from. This made me nervous. Dana’s knowledge of tea—its craft, ceremony, and variety—grants her the right to be elitist, a certified tea snob. But, she’s not. She even drinks tea from a box on occasion. This made it easy to ask what the difference is between hand-blended loose-leaf tea (like tea.o.graphy tea) and what I usually drink. Dana explained using tomatoes. Grab a tomato at the supermarket. Then pick one up at the farmer’s market. Take a bite out of both. The difference in flavor is evident, even to those (like me) who do not have practiced or refined palates. Later, I would think of it as the difference between chocolate chip cookies from your grandmother’s kitchen and the ones in plastic off the shelf. My cookie analogy spoke to the craft and art of blending tea. Dana’s tomatoes spoke to the ingredients. She considers where the leaves, spices, herbs, and flowers come from, and how they are processed. Not surprising, she uses all organic and fair-trade ingredients. Handcrafted loose-leaf tea is just what those words mean. Handcrafted: A person, using their hands, combines an amount of oolong tea leaves, young rose buds, roasted cacao, cardamom, peppercorn, and vanilla bean. Loose-leaf: the tea, herbs, and spices are not finely ground. The mix doesn’t look like something from your spice drawer. You can see, and if you wish, pluck out the rosebuds, cacao bits, and withered tea leaves in Chocolate Rose Oolong (just described). From tea.o.graphy.com: “The resulting brew is a light golden hue with a ravishing scent of chocolate & flowers.” See the website for photographs. The mound of Chocolate Rose Oolong looks more like an art piece then something to pour boiled water over. Dana Blair with her tea at TCEDC’s Valentine Weekend vendor event. Dana blends the teas. She took her idea about the boat, cup, and compass and turned it into a logo by downloading a drawing app on her iPad. She manages marketing. She makes the sales calls. It would be a one-woman show except for her apprentice, Camille Cooper, and life partner, Steve Chavez. Camille brings a fresh creativity, energy, and refined tasting skills. Steve is the mastermind behind using tea in mixed drink and food infusions. Boil rice in Genmaicha (green tea and brown rice blend). Pour Lady Grey (black tea blend) over ice, add gin, a touch of honey and lemon for a Lady Grey-Tini. Steve’s two children also contribute. They came up with tea popsicles for the summer. And, if you like chocolate, stop in at Parcht Bottle Shop on the Plaza and try the tea.o.graphy truffle trio, truffles infused with the Ginger Spice, Lady Grey, and Fall Fig blends. Recently, Dana and I met at Lambert’s on a Tuesday evening to talk tea. There wasn’t time for tacos or margaritas. She was on her way to Albuquerque for meetings and sales calls the next day. Business keeps her schedule full. “This is how Mondays usually look,” she said. I could see no lines, dates, or white space on the page, just rows of neatly crossed out to-do lists. I noticed Tuesday still had some uncompleted tasks, and Wednesday looked like another impossible day. Even so, on Tuesday evening she wore none of the stress or hurriedness — just enthusiasm about her tea. Take the compass and look east. Dana’s journey with tea began in China in 2009. She was teaching English in Guangzhuo, a port city north west of Hong Kong. Tea houses in that region are small, intimate spaces. Tables are hunks of wood. Tea is presented, not served. The cups are shot-glass size, good for one or two sips. Dana stopped in a teahouse like this and fell into conversation for hours with the proprietors, a mother and her son. “We drank practically hundreds of cups of tea because it’s served in tiny clay cups,” she said. This small tearoom is where her tea education began. During her time in China, she sought out teashops and tearooms and started experimenting with her own blends. When Dana returned to the U.S. in 2010, she landed a job in Santa Fe at The Teahouse, working under Dionne Christian. Her journey with tea would continue. Café sans Café was the first blend that she brought to market. “I was trying to blend a tea bold enough to stand up to coffee,” Dana said. 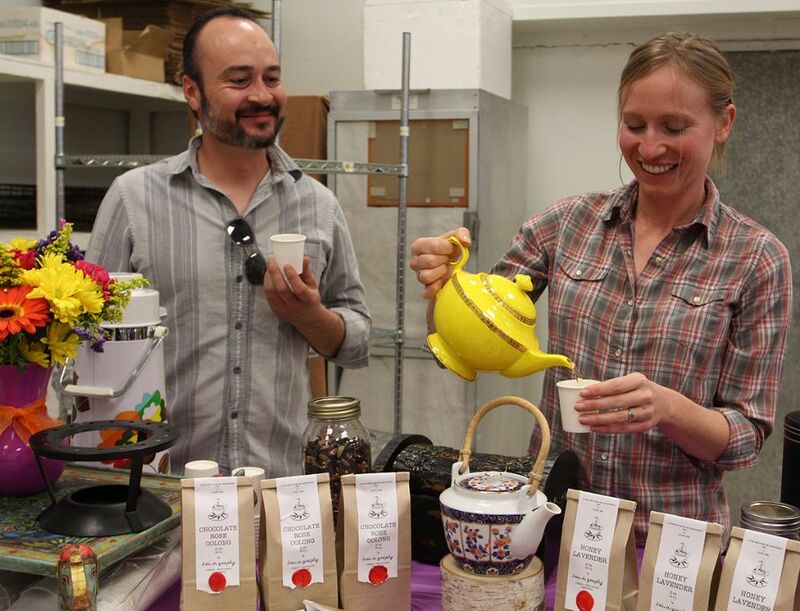 Gutiz, the Latin-French Fusion restaurant in Taos, was the first place to sell Dana’s teas. Before Dana, Gutiz usually sold about 100 cups of tea a month. Now, after Café sans Café and other blends were offered at the eatery, the restaurant serves 900 cups a month. Those numbers speak for themselves. 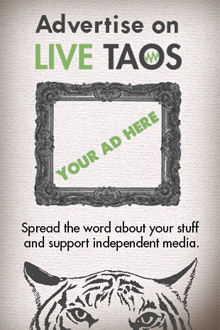 Find tea.o.graphy tea at CIDs, Taos Market, or when you’re dining at El Mez and Gutiz. 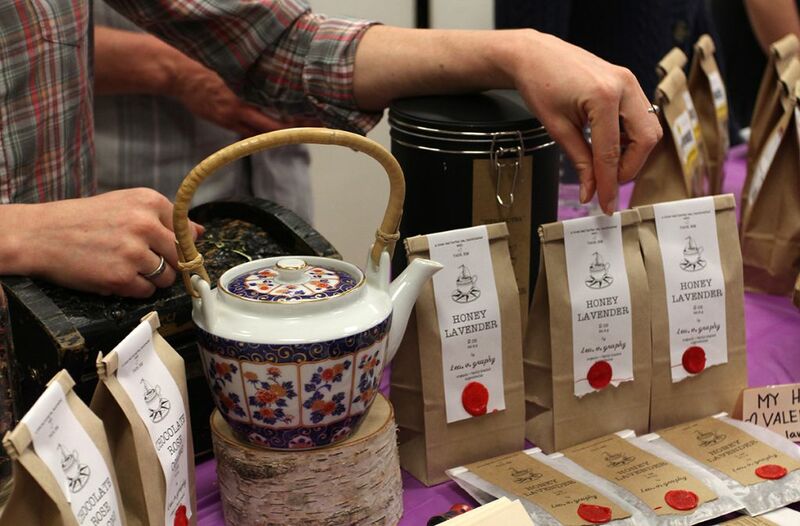 And if you want to chat with Dana about tea and sip samples, meet her at the Winter and Summer Farmer’s markets. Dana is a crafter and curator of teas. She’s also somewhat of a poet. Chocolate Rose Oolong, Fall Fig, Fluers de Provence, The Cats Pajamas are names of her blends. All have stories. One afternoon I sat with Lady Grey. Along with Ginger Spice, it’s one of her best sellers. Fruity teas are not my thing and I noticed orange peel was included in the black tea blend. But the orange hung in the background, crowding the periphery with lavender and vanilla bean, letting the bold black tea take center stage. I understood what Dana meant by the tomato from the farmer’s market. And, this is when I thought of grandma’s cookies. 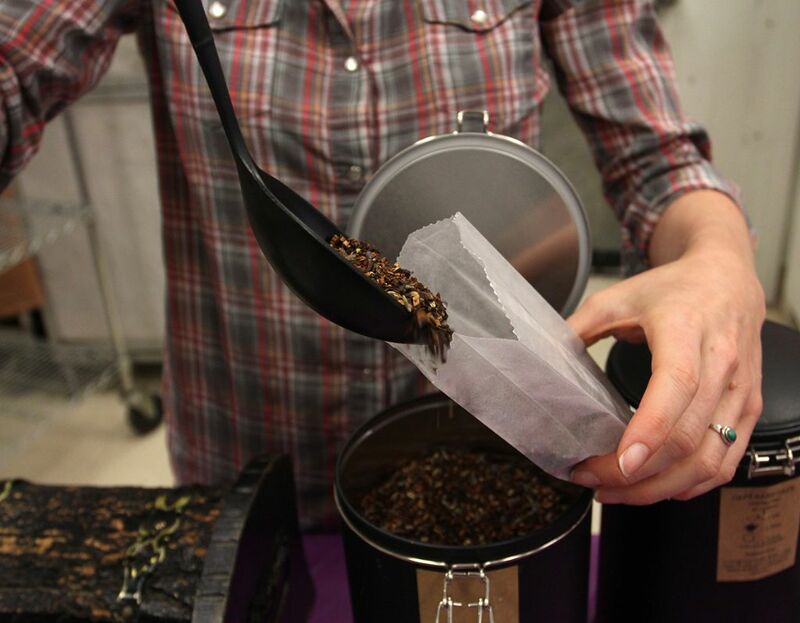 The complexity of flavors and richness of aromas is not what we get out of mass produced (though affordable) tea bags. With a pinch of Lady Grey in my palm, I could see the orange peel and lavender bits. In the aroma, there was imagination. Recently Dana started working with a family in Darjeeling, India that runs a small tea plant farm. It was an improbable connection. “It’s hard to find and have relationships like this,” she said. The business relationship was the result of a friend of a friend of a friend. And this is exactly where tea.o.graphy’s boat wants to sail: sourcing tea leaves from small, family run, bio-dynamically grown tea plants all over the world. Makaibari Estate Darjeeling is just that. Straight from the steep inclines of Darjeeling, cultivated and harvested by a few hands. For the tea purists out there (those who raise eyebrows about combining such things as cacao, lavender, vanilla bean, citrus peel into tea blends), Dana has sourced a selection of pure tea. Among others, Brahmaputra Valley Assam comes from Northeast India and Clouds and Mist (Yun Wu) is from China’s Mount Lu. Kukicha is a blend of stems and twigs of the tea plant. “When you enjoy a cup of tea, usually you are enjoying flavors from a distant part of the world,” she said. At Lambert’s on Tuesday, the day was late and the week still ahead. A group celebrated a birthday nearby. They roared with laughter and cheer. Dana and I leaned in, almost shouting at each other about the cinnamon, red chile, and fennel seed in her Sandia Rose blend — no matter though. I didn’t have to hear a word. Dana’s passion for her craft emanated from her face. The next day, when I sat in the afternoon sun with cups of High Desert Sage and Chocolate Rose Oolong, I understood why she was so enthused. Her teas are actually like the descriptions — a fresh desert rain, an epicurean offering. They take you places. 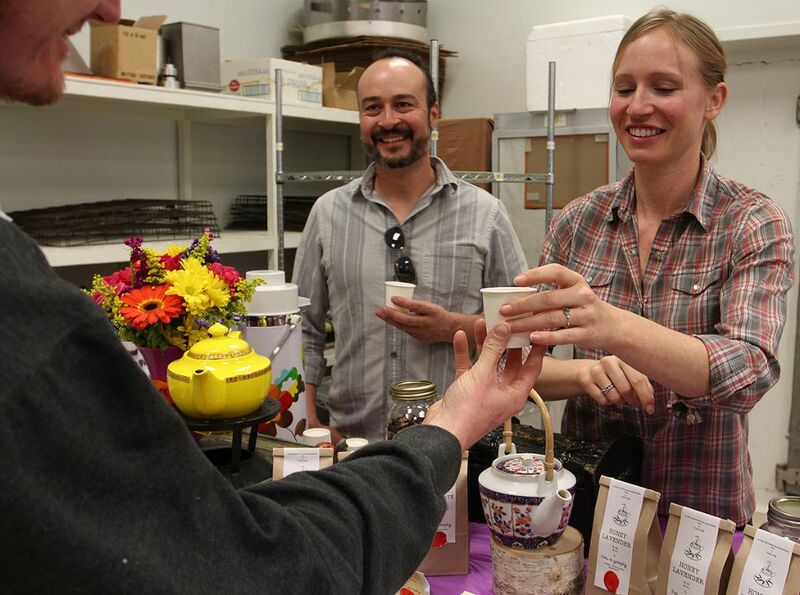 Dana Blair and her partner, Steve Chavez serving a sample of tea.o.graphy’s Honey Lavender blend at TCEDC’s Valentine Weekend event.